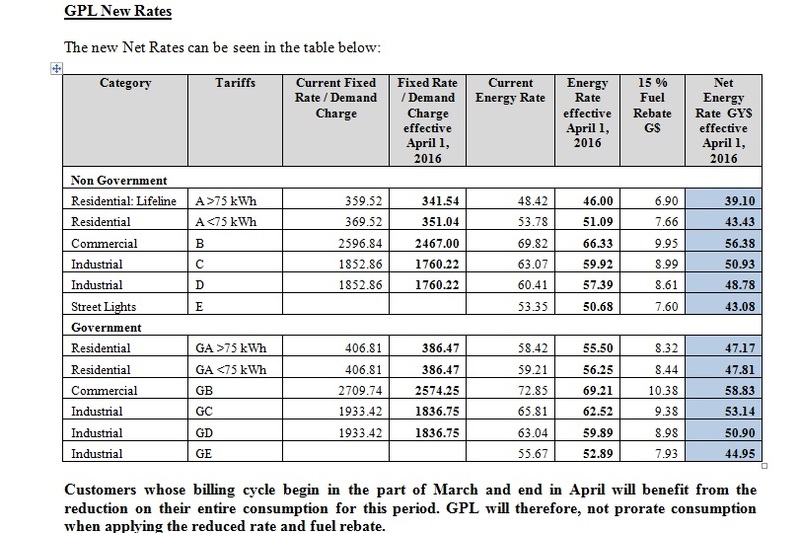 The Guyana Power and Light Inc. on Thursday announced a 20% reduction in net rates for the supply of electricity across all Tariff categories effective April 1, 2016 as a result in the fall of world oil prices during the past several months. GPL explained that the reduction would be applied as a 5% reduction on the basic rate of both fixed charge and energy charge, and a further 15% fuel rebate on the energy charge. “Given that the Company had previously applied an interim 10% fuel rebate on the energy charge in March 2015, the overall effect would see an additional 10% reduction on electricity bills,” GPL added. “The Company took into account the reduction in world market prices for fuel over the past year, which has favorably impacted its overall costs and wishes to pass on the benefits of these reductions to its Customers,” the power company said in a statement. The decision was taken after an “intensive review” by GPL’s Board of Directors in consultation with its Executive Management team. GPL is engaged in a Power Utility Upgrade Program financed by the Inter American Development Bank (IADB) with grant funding from the European Union (EU) to the tune of US$64M. This Program is intended to strengthen management, improve operational efficiencies and reduce losses. The Company says it acknowledged that there is some level of public dissatisfaction with its services and is committed to actively addressing all issues relating to this, including faster response times to customer queries, more efficient delivery of services, ensuring the integrity of its officers both internal and contracted, delivery of timely billing and information, amongst others. “GPL also recognises that our customers are the ultimate stakeholders and therefore is requesting the public’s patience and understanding.